Early Bird tickets for Hackaday Belgrade have just gone on sale, but they will not last long. This is Hackaday’s premier European hardware conference with talks, workshops, great food and drink, entertainment, and a hardware badge for hacking and demos. Festivities will go all day on 26 May and carry long into the night. The last time we did this was two years ago and it was completely sold out — now’s the time to get in on the fun. Who’s speaking, what are the workshops all about, what does the hardware badge do, and what music do you have lined up? Trust your gut — we’ll have more details soon enough but you know this conference will be epic and it’s worth your time and treasure to be there. To reward your enthusiasm, Early Bird tickets are a much better deal than general admission. Our Call for Proposals is now open. We seek talks and workshops exploring the most interesting uses of technology and the culture that goes along with it. You know those people just outside of the Hackaday orbit who are tired of hearing about the stuff you build and the coding tricks you discover? Those people won’t be there. Everywhere you turn at Hackaday Belgrade, fascinating conversations await. You’ll want it to last a week but it’s just one day… plus a little more. Plan to arrive in Belgrade on Friday. There will be an unofficial meetup at a bar (last time we took over most of the place). The weather in Springtime is amazing and having pivo on the porch until far too late in the evening was a blast. 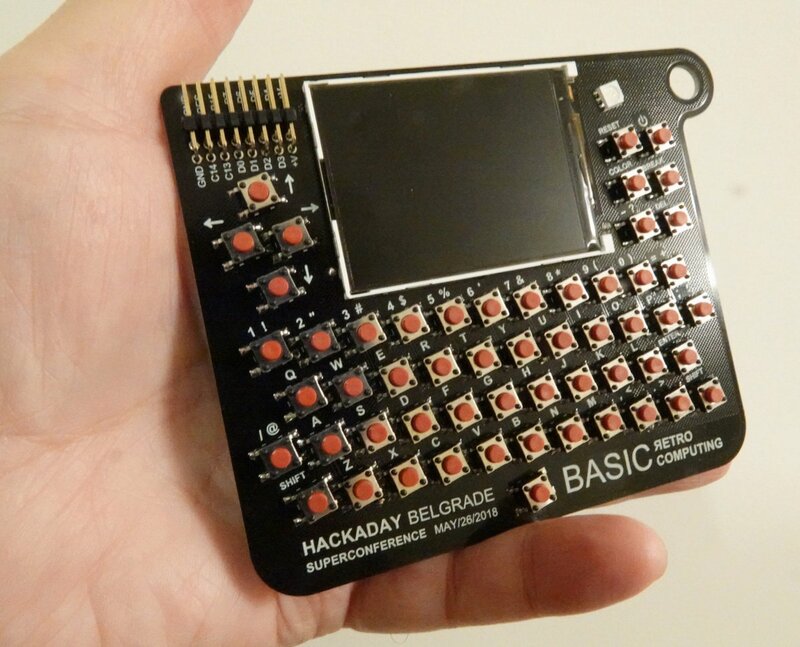 Hackaday Belgrade Badge prototype. Voja Antonic, creator of the Galaksija computer — now in museums around the world — just Tweeted this teaser image of the conference badge design. Things get started, not too early, on Saturday around 10 AM, and we’ll have coffee and treats to kick off the day. The baristas in 2016 were incredible, and the food — lunch and dinner — were as well. These amenities ring the socializing area of the conference in the lobby of the main hall. Talks and workshops will go all day but at 7 PM it’s all about hacking while our crew lay down a live IDM set. At 11 PM the badge hacking demos begin and the live DJ steps up at midnight. Don’t let things end there. I vaguely remember a 3 or 4 AM ćevapi run after the last Hackaday Belgrade conference, and there were multiple groups planning museum trips the next day. Belgrade has a wonderful Museum of Science and Technology (I made it to that one), a Nikola Tesla Museum (I’m planning to get there this time), and a multitude of interesting attractions. I’ll save you from having to see my gallery of food photos, but the city is fun, inexpensive, and has really delicious cuisine. This is a weekend you’ll remember forever. Make your plans now! I’m from the north of the Netherlands, this is a bit to far from my home to worry about the ticket price. It would cost me at least 300 to 400 Euro’s to get there and back. Actually if you fly between major airports amsterdam-belgrade it can be under 150€ for a return ticket. Not to mention that for 30€ you can eat and drink, quality meat and nice drink for a day and you don’t have to pay 50€/nigh if you want your own bathroom. Not to mention the night life in the old part of town(where the conference will be). Hell I am just thinking how to organize my work to fly there from Denmark, maybe for a few days more than just a weekend as 2 years ago. In case anyone is planning to drive to conference from PL/CZ/HU etc via Bratislava, I’d be glad to join him/her and share the expenses. Maybe from CZ, i am looking for more options actually. PIC32 seems to be Voja Antonic’s favorite development platform so that badge is going to have quite a bit of processing power for something designed to run BASIC. This badge looks really fun–I hope you HaD folks order plenty and put the leftovers up on Tindie! How much for just the badge? Early bird tickets already sold out ?